Nice ringing this morning, migration is picking up. Lots of Lesser Whitethroats and good numbers of Bluethroats and Chiffchaffs. Reed Warblers are back with some old recoveries. 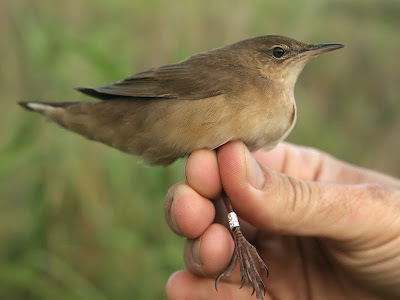 Had my first Savi's Warbler of the season. Other good birds in the field included Little Crake, Reed Bunting and several Balkan Warblers. Festival update - day 6 - Lesser Sand-plover! Festival update - day 5 - Blyth's Pipit!